SENSEX is a shortened term given to the 'Bombay Stock Exchange Sensitive 30 Index'. The index is a broad based, weighted average composition of the share price of 30 large capitalization companies within the exchange. This index is considered one of the Bombay Stock Exchange's key metrics of market performance and has been in existence since 1986. Since exchange indexes measure performance of stock baskets, analyzing SENSEX using technical methods can assist with trading tactics and strategy. Two such technical measures are oscillators and the Elliot wave theory. The remainder of this article will discuss how these two methods of technical analysis can be applied to SENSEX. Simply put, oscillators measure buying and selling opportunities at the high and low ends of market pricing. Several oscillators exist including the Stochastic Oscillator, Percentage Price Oscillator and the Money Flow Index (investopedia.com), however other commonly used and referred to oscillators also exist. Each oscillator indicates different values based on varying underlying conditions for which a security price may be more apt to move in a certain direction. To illustrate the above point, the Money Flow Index (MFI) measures volume of capital moving into a security. When the MFI value moves higher, it means the increase in capital inflow is rising, however, if the value is too high, it means the capital inflow has been taking place for a while and a price trend reversal may occur. The essential basics of Elliot Wave Theory is that it makes use of stock price movement graphical 'waves' and impulsive or corrective trend analysis of those waves. What this means is that when the zigzag pattern of stock price movements on a graph are illustrated, a pre-determined wave theory i.e. Elliot Wave Theory is applied to the patterns. These patterns are simply two consecutive patterns of zig zag waves of 5 then 3 movements or 3 then 5 movements. Specifically, if the price trend moves downward with 1 down movement followed by an up then down movement, and is subsequently followed by the same pattern in the other direction, i.e. up, then the Elliot Wave principle applies. After the down or up sequence, the Elliot Wave Theory indicates the probability of the trend continuing as previously is higher than had the trend not existed. The next step in applying both oscillators and the Elliot Wave Principle involves obtaining the price chart for the SENSEX for a given period of time. These charts can be obtained from financial websites and the Bombay Stock Exchange website itself. 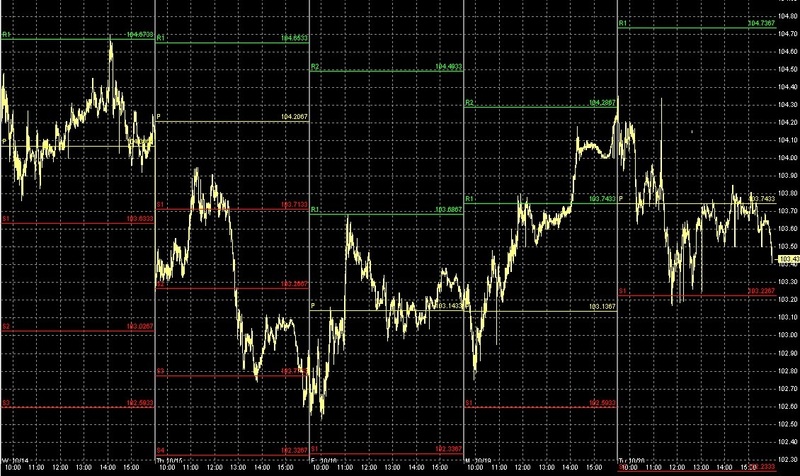 Once a chart and price history values are obtained, the oscillators for the preferred point of time can be calculated and the Elliot Wave patterns can be looked for. Some financial websites search for wave patterns and/or calculate oscillators for the investor, trader or analyst to save them time in identifying, calculating and applying the oscillator formulas and wave trends. Should the need to calculate the oscillators arise, the individual oscillator formula should be acquired then utilized for the correct value. Similarly, for the Elliot Wave theory, the wave patterns should be manually looked for and identified individually rather than via a technical analysis software or financial website feature. Several financial websites and/or technical analysis websites exist that either provide or specialize in technical analysis tool and software. The SENSEX is a metric that indicates performance of companies within the Bombay Stock Exchange. This index is similar to the Dow Jones Industrial Average in the U.S. however is comprised of 30 large Indian corporations weighted in the index by their equity capitalization values. In studying the SENSEX, both oscillators and the Elliot Wave Theory can be applied for the purpose of technical trend analysis. Both these indicators are used to forecast future price movements either up or down based on previous trends in securities pricing. To apply oscillator tools and the Elliot Wave Theory to the SENSEX involves obtaining a time period for which price trends can be illustrated and searching for and/or calculating the oscillator values at the time of interest and/or the wave pattern positioning for the same. If the oscillator value is above a certain point, it may be a downward trend could occur and if the Elliot Wave pattern sequence is evident, the possibility of the security's market price following this pattern either up or down is forecasted. Neither oscillators or the Elliot Wave Theory are absolute indicators meaning there is room for error and the technical analysis is not 100 percent accurate. Rather, oscillators and waves can be used to estimate price trends and movements based on pre-derived mathematical and/or statistical relationships and patterns.